Vaccines can contain aluminium, mercury, formaldehyde, antibiotics, yeast, GMOs, animal proteins, animal DNA fragments, and other substances that are potentially dangerous when injected. Usually vaccines are injected into muscle, where they form a slow-release reservoir intended to stimulate the production of antibodies for some time. The ingredients are not simply flushed out like they might be if taken in as food, and some ingredients such as aluminium and mercury make their way to the brain and accumulate over time. Aluminium, in the form of compounds, is added to many vaccines to help stimulate an immune response to the disease pathogens in these vaccines, because the pathogens do not cause enough inflammation on their own to raise antibodies. The problem is that the aluminium also stimulates an immune response to everything else in the injection site reservoir, including to animal and food proteins in the vaccine, and also to any fragments of the person’s skin, muscle and blood that may have entered from damage by the needle. Thus there can be an immune response to all of these – this is thought to be a factor in the epidemic of immune system problems, such as asthma, allergies, eczema and autoimmune diseases. Aluminium in vaccines is also thought to be a factor in neurological problems, due to it accumulating in the brain over time. Mercury is used in vaccines as the preservative ethyl mercury, a water soluble and very toxic form of mercury, which was developed in the 1920s to prevent vaccines from “going off” in the vial. Ethyl mercury is variously called Thimerosal, Merthiolate and Thiomersal. Ethyl mercury has been been taken out of most vaccines – it is still in multi-dose flu vaccine vials and is found in residual amounts in some others. Mercury in vaccines is thought to be a factor in neurological problems. The elements aluminium and mercury are both metals. Mercury is known as a “heavy metal”, while aluminium is not. For more information about mercury in vaccines please read this article TRACE AMOUNTS: THE DOCUMENTARY THE CDC DOESN’T WANT YOU TO SEE and consider watching the movie Trace Amounts. Viruses can only multiply inside living cells, so viruses used in vaccine production are grown in animal cells kept alive in laboratories. 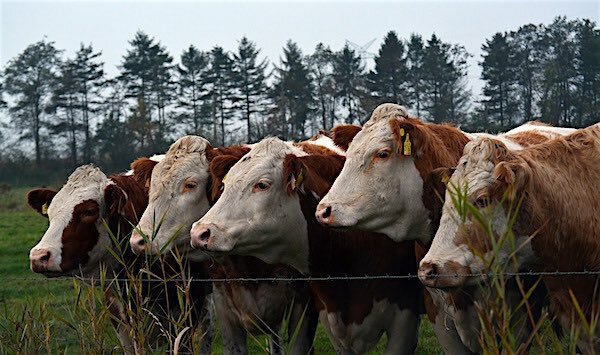 Bacteria for vaccines are grown on animal products, and designer proteins in vaccines can be generated in yeast, bacteria or other living cells. Cells and products from a variety of species are used, including humans (aborted fetuses), monkey (kidney), cow (heart), calf (serum), chicken (embryo and egg), duck (egg), pig (blood), sheep (blood), dog (kidney), horse (blood), rabbit (brain), and guinea pig. Fragments of DNA and proteins from animals are used deliberately in some vaccines, as adjuvants, and they can also make their way accidentally into the vaccines. In both cases these fragments have been linked to many disease conditions. Also, manufacturers are not required to declare some vaccine ingredients if they are safe as food, such as nut oils, and these have been linked to food allergies. 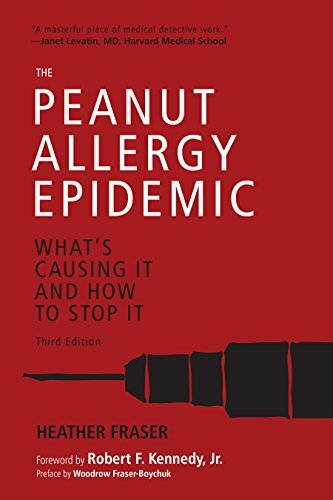 For more information please see the following articles, and also read Heather Fraser’s excellent book The Peanut Allergy Epidemic: What’s Causing It and How to Stop It Be sure to get the THIRD (red) edition. What Are MRC-5 and WI-38? And Why Are They in Vaccines? In Australia infants routinely receive Infanrix hexa at 2, 4 and 6 months of age. A dose has vaccines for 6 diseases. See the Victorian vaccination schedule. On the Product Monograph for Infanrix hexa, in the ‘Contraindications’ section starting page 4 it says the vaccine “should not be administered to subjects with known hypersensitivity to any component of this vaccine”, and mentions hypersensitivity to the antibiotics it contains. 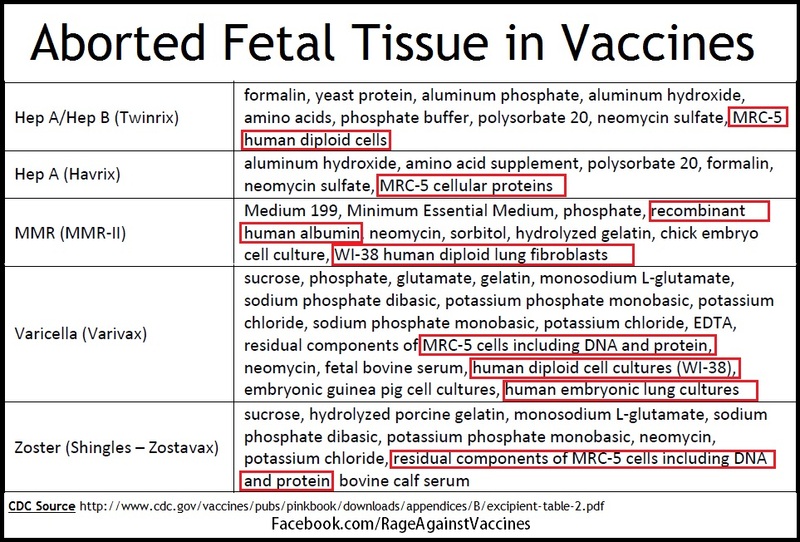 On pages 23 and 24 are the components of the vaccine dose, including 12.6 mg lactose, 0.7 mg aluminum adjuvants (as aluminum salts), 0.12 mg aluminum (AlPO4), residual formaldehyde, neomycin sulphate (an antibiotic), polymyxin B sulphate (an antibiotic) and up to 5% yeast protein. How would you know if a young baby might be allergic to any of that? Remember these components are being injected into muscle, not swallowed, touched or breathed in.